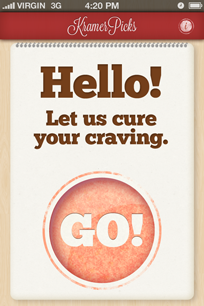 Let us read your mind. 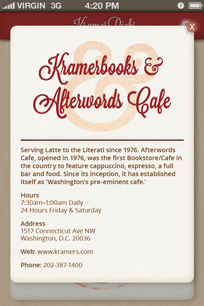 While waiting for a table, browsing, or simply spending time at Kramerbooks & Afterwords Cafe and Grill in the DC area, use this app to help you choose from a wide variety of book and menu options. 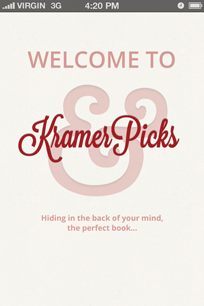 With KramerPicks, you can battle the beast of indecision over one of the delicious dishes, drinks, or books at Kramers by answering a simple quirky question. 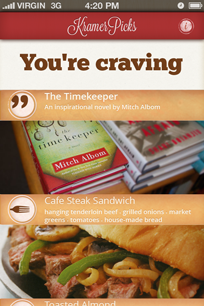 Based on your answer, KramerPicks serves up some sensational suggestions to cure your craving! 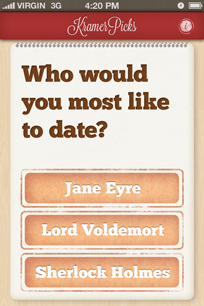 During our user testing, most users found the app to be simple, quick and fun. It was easy to navigate and the process was clear. We noted that we could improve button hierarchy and provide clearer directions to download the app and that we needed to encourage users to explore results or play again. 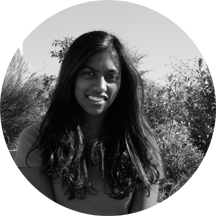 Preeta is a 22-year-old Graphic Design major at American University, Washington, D.C. She is from Lancaster, Pennsylvania, and prefers to travel in Wonka's glass elevator whenever possible. 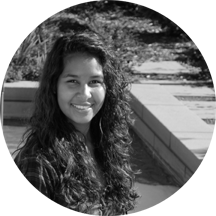 Raquel is a 22 year old Graphic Design major and Music Performance minor at American University, Washington, D.C. She is from The Republic of Trinidad and Tobago, but plans on moving to Wonderland when she retires.